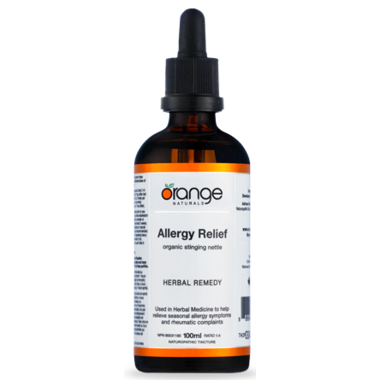 Orange Naturals Allergy Relief Tincture contains stinging nettle. Stinging nettle has been used for centuries in Herbal Medicine to help relieve allergy symptoms. Research has demonstrated that stinging nettle is more effective than a placebo in treating allergic rhinitis. This is likely due to its natural anti-inflammatory properties. Stinging nettle may also help speed the healing of hives through its ability to block chemicals which normally trigger the release of histamine. Ingredients: Each ml contains 250mg of organically grown Stinging nettle (herb tops, Urtica dioica). It is a 1:4 herb top extract. Stinging Nettle herb top helps to relieve seasonal allergy symptoms and rheumatic complaints. It really works. I've never suffered from allergies until just recently. My symptoms went away within a week. Great natural product!